Built in 1873, the Customs House survived the fire of 1904. Built in 1873, the Customs House survived the fire of 1904. Many of the surrounding buildings burned down and created empty lots to the west. 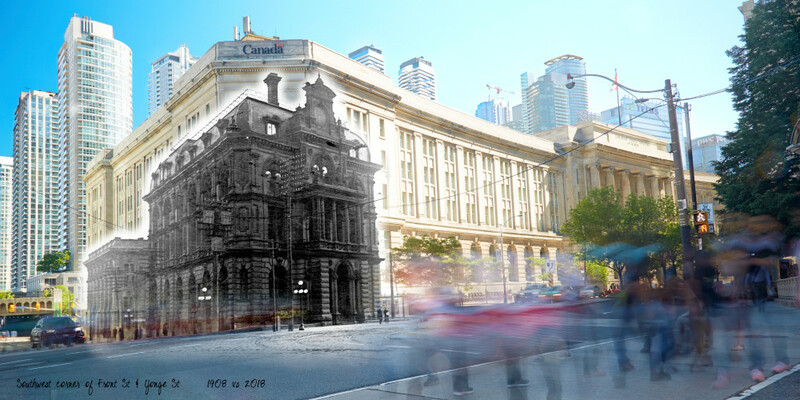 In 1911 the Toronto Civic Improvement Committee brought forward a plan to build a larger Customs House. It would be the third of it’s kind occupying the same corner. At a cost of $2 million, the new Customs House was approved. Many delays ensued, it’s demolition didn’t occur until 1919. It sat as an empty lot until 1929 when proposals were requested. As a result the Dominion Public Building now stands as a compliment to Union Station.